Although we like to travel independently, when we visited China we wanted to hire a guide. We can figure out the basics when we’re reading street signs in French or a city map in Italian, but we have no point of reference in Mandarin. We used a different guide in each area we visited: Guilin, Xian and Beijing. They were all terrific in their own way, but Qing, our guide in Beijing, was truly special. She was the modern face of an ancient country, a young woman in her twenties whom our girls adored. She took us to the Great Wall, the Forbidden City and the Night Food Market. But the highlight of our time in Beijing just might have been the visit to her family home. On the final afternoon of our trip, Qing graciously invited us to her home in one of the hutongs, or tiny alleys running through Beijing. Many of the residences in these areas are built around courtyards. Hutongs are truly unique to this city, and we were honoured to be invited to one. Qing’s family of five lived in a small four-room residence. Although no one in our family speaks any Mandarin, and Qing was the only English speaker in her family, we couldn’t possibly have been given a warmer welcome. Her mother served us a delicious snack of chocolate cakes, persimmons and flower tea. Her grandmother spent much of the time cheerfully chatting with me in Mandarin, convinced that “Canada” was a northern province of China. 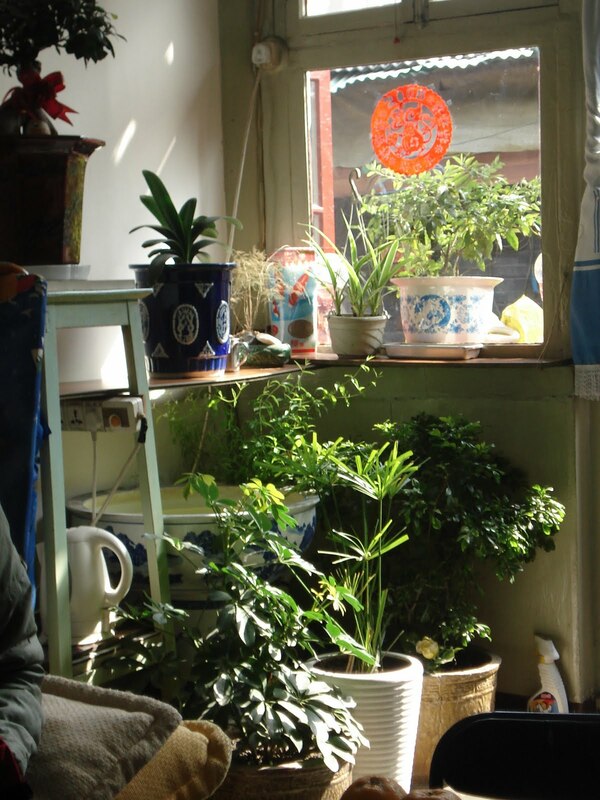 And Qing showed us around her home – two bedrooms, a living room and a kitchen overlooking the lovely courtyard. harder with a persimmon in your mouth. As a North American who lives in a generously sized house, it was an amazing experience to visit a family with such a small footprint. And once again I was reminded how incredibly lucky we were to meet this wonderful family who lives halfway around the world from us. Yet another lovely post. 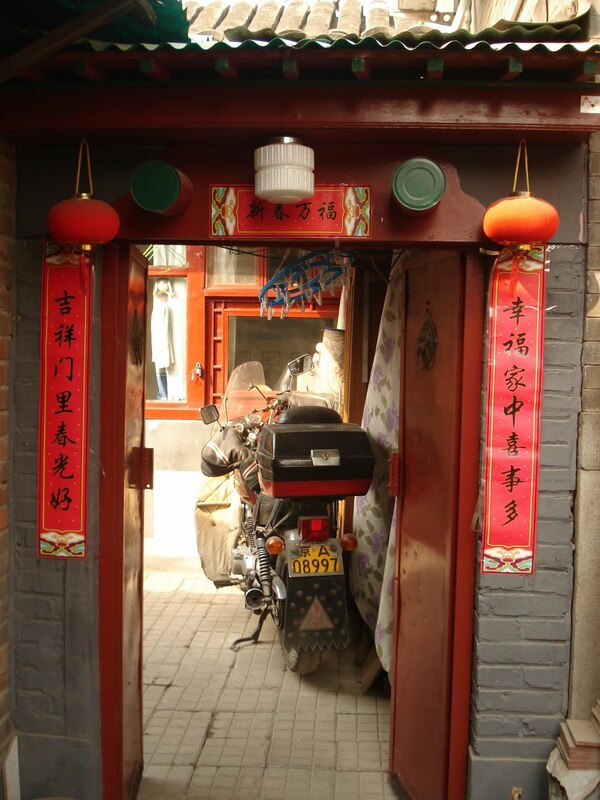 I've always been so intrigued by the exotic, beautiful little alleys that run through the streets of Beijing. If only western society showed it's elders the same amount of respect…we have a lot to learn from the rest of the world. I'd love to visit Bejing. It sounds like a great place to visit and it seems that people are so nice there. Glad you had fun Beth. What delight to read this post. I have family who were in that area a few years ago and were so taken with the scenery and the special people Thank you for sharing this wihh us. What a delightful visit – she is too adorable! That's really lovely! How nice you got to experience the warm family of your guide. What a special experience, and how wonderful for your guide to open up her home to you. Sometimes we learn and see more in such an intimate setting than we do viewing the great tourist attractions. You really got a view of their personal lives. What a neat experience- how nice that the guide welcomed your family into her home. Just this afternoon my 3 year old was asking me if we could go to China. I told him hopefully one day! How very special to be invited to your guides home and experience the warm hospitality from her family! Very special memories! What sweetnesses there are to be found. The generosity of people always bring me smiles. Too bad governments don't understand what the people do. ps. I love the photo of the plants in the sunny window! Jess, my daughters are great travelers, and for the most part they do appreciate our trips! And you're right about the food references, Ruth, but it comes naturally. 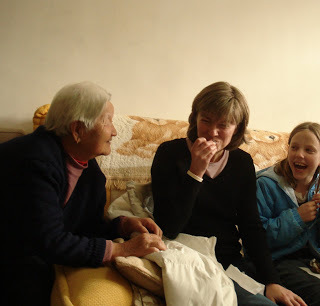 I was embarrassed to see that in all three of the photos taken of me with her grandmother, I had food in my mouth! How wonderful to get to visit a home in China! I'm sure the family loved meeting you too, even if the communication was a bit tough. What a special experience you had! And thank you for sharing it with us too! Another lovely post! I so enjoy your travel stories. How surreal! There's really nothing more special than connecting with someone from another culture in their homeland. It is the perfect combination of pride (theirs), interest (yours) and enthusiasm from everyone involved. My son lived in the Philippines for a couple of years, and so appreciated all that we have at home, modest though it is. Happiness is definitely not in "things". What a great experience for you. This sounds just completely amazing. I've never been to China–I'm seriously loving your posts, it's like I'm getting to experience the country vicariously through you. One of my favorite things about traveling is always the unexpected connections you make–and they're all the more precious when they transcend boundaries of culture, language, and experience. Thank you for sharing this with us. It just goes to show that no matter our language or circumstance, we are all just folks. Love this since I've been to China too. I so agree about needing a guide. When we were in Hefei, we only ate once outside our restaurant and had to point because hardly anyone there speaks English. I love that picture of you with persimmon in your mouth. It says so much. 🙂 And I can't believe I never would have thought about getting a guide. Brilliant! What a sweet lady–Canada is a northern province of China. How nice that you enjoyed such a warm welcome. This is such a great post. I love, love, love having guides. They are so often individuals who are proud of their culture and willing to be more than generous with those they are guiding. how wonderful that your guide invited you to her home, a very special experience for sure. It's always such a unique experience to visit homes in different countries and cultures. I find it so fascinating! What an amazing experience to have visited a family from China. Definitely a better point of view compared to the usual touristy places. I am also amazed at the places you have been to. One of my favorite parts about traveling is meeting other families and seeing how they do life. It sounds like this family offered your family wonderful company and perspective (as I'm sure your family did the same for them!) Thanks for sharing another great post, my dear friend. You are a blessing! Mark and Matt went to China a couple of years ago and cannot wait to go back…they traveled around a lot there (11 days of traveling inside China)and would have loved the opportunity to meet a family in their home…this was a great post. What a wonderful experience. I love your travel posts! And it's the final push I needed to finally getting down to writing about my own holiday. I've been non-blogger far too long!